It is easy to assume that our more common and abundant foods are not all that valuable nutritionally. In fact, they are often as good as, or better than, some of the perhaps more exciting foods available. Both dandelion leaves and young nettles bring a lot of good to the table. Surprisingly, as some recent studies show, so do those little white button mushrooms found at our grocery stores. For one, they have a big effect on our intestinal flora. People with inflammatory bowel diseases, such as irritable bowel disease or ulcerative colitis, have many fewer types and numbers of “good” microbes growing in their intestines. As well, the microbes that cause food poisoning reduce the types of beneficial microbes in our intestines as they make us sick. But this lack of diversity is not immutable: We know that diet can rapidly change the composition of the flora, for good and for bad. In one study, one group of mice had a diet that included dried, ground white button mushrooms (about 1% of their diet) while another group ate the same food but without mushrooms. After 2 weeks, the variety of beneficial strains increased while the variety of more troublesome strains dropped in the mice eating mushrooms. The mice were then either treated with chemicals that trigger colitis or with microbes that trigger what in humans would be a Clostridium infection. The mushrooms created an intestinal environment that both protected the mice from chemical colitis and sped up healing from the intestinal infection. In other words, mushrooms in the diet enhanced diversity, and a diverse mixture of good microbes protected the mice from inflammatory bowel conditions and sped up healing from food poisoning. Another study compared five different mushrooms: White buttons, oysters, shiitakes, maitakes, and crimini (crimini are older white buttons). First they analyzed the effect of these mushrooms on immune cells. Each triggered changes that are useful in preventing cancer. Surprisingly, the white buttons had the strongest effect in one test and were equal to crimini and shiitake in another. And, as in the previous study, the mushrooms protected the mice from chemical-induced colitis. Many different types of mushrooms have been shown to inhibit the growth of prostate, colon, and breast cancer cells. In one test of seven vegetables known to inhibit the growth of breast cancer cells, white button mushrooms had the strongest effect. So, in terms of enhancing our odds of avoiding cancer, it makes sense to include these little guys in our diet. The media has made a big to-do about how white button mushrooms “surpass” the effect of shiitake, maitake, and other more exotic mushrooms, and indeed buttons have in some small studies. But the real message is that we should eat more mushrooms, more frequently; not that we should switch to white buttons only. A study on mushrooms and arthritis is on point. In this study, mice were fed a regular diet or a diet with 5% added powdered shiitake or white button mushrooms. Then they were injected with chemicals that inflamed their joints, much as rheumatoid arthritis would. Those eating white buttons had a lower incidence of arthritis and those who ended up arthritic had a much less severe form of arthritis. Those fed shiitake gained different benefits: They suffered much less bone damage. The study conclusion was that both types of mushrooms were beneficial in arthritis. Some sources report that criminis (the little brown buttons) protect against heart disease. I’ve not seen that study but have read others showing that maitake, oyster mushrooms, and other mushrooms I am unfamiliar with (such as chestnut mushrooms and blushing wood mushrooms) help normalize blood fats and prevent atherosclerosis. There are many reasons why we really should eat mushrooms regularly. Most days we can use white and brown buttons while taking forays into the edible wilder and more expensive mushrooms from time to time. Ultimately, the greater variety in our mushrooms, the greater variety of beneficial microbes in our intestines, and the greater variety of health benefits to be gained. 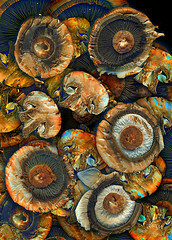 This entry was posted in Food and tagged atherosclerosis, breast cancer, chestnut mushroom, clostridium, colitis, colon cancer, crimini, diet rheumatoid arthritis, food poisoning, fungi, intestinal flora, irritable bowel disease, maitake, mushrooms, oyster, prostate cancer, shiitake, ulcerative colitis, white button. Bookmark the permalink. Recently I read that mushrooms should not be eaten raw. I couldn’t find the original link I read but this mushroom specialty site gives the same advice – cook first. [http://www.mykoweb.com/articles/EatingRawMushrooms.html ] But it seems like cooking before consuming would kill the beneficial microbes. What to do? The beneficial microbes feed on complex sugars in the mushrooms, they are already in your body, so cooking is not going to affect them. Members of the Agaricus family, to which button mushrooms belong, may make a carcinogen agaratine that breaks down when cooked. So cooking protects us from that. In addition, cooked mushrooms taste better. Thanks for this information. I knew about the benefits of wild and asian mushrooms, but didn’t realize white button mushrooms are also beneficial. One correction: crimini mushrooms are actually baby bella mushrooms, not older white mushrooms.